A very rare magnitude 4.3 earthquake struck the Chinese capital Beijing on Monday, the government said the 4.3 magnitude quake’s epicentre was in a county that is part of Hebei’s Langfang city. Earthquakes in this part of China are extremely rare although in 1976, the Tangshan earthquake, just to the east of Beijing, killed up to 300,000 people. A 2.3-magnitude earthquake struck an area of North Korea just 400 km from Beijing, China early Wednesday, according to South Korea's meteorological agency. Seoul said the earthquake occurred at about 8.7 miles from Ongjin, South Hwanghae Province, according to Yonhap news agency. The earthquake had a five-mile depth, and natural causes were cited as the reason for the tremor, Seoul said. The quake comes only a few days after South Korea reported an earthquake in waters near Pohang, North Gyeongsang Province. The 4.6-magnitude tremor occurred only three months after a medium-sized quake struck the South Korean region. 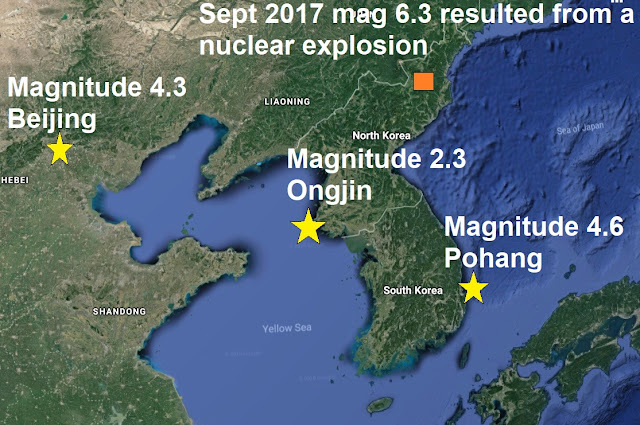 In early February a 2.6-magnitude earthquake struck an area of North Korea where Pyongyang had been conducting its underground nuclear tests. South Korea's meteorological agency said Tuesday the earthquake originated from an area about 30 miles north-northwest of Kilju, North Hamgyong Province, and is likely to have been triggered by North Korea's sixth nuclear test.